As the earth follows an elliptical path around the sun, its tilted axis causes sunlight to reach the earth’s surface at various angles. This is why the length of days and nights are not the same anywhere in the world. Two terms are often used when people discuss this subject: solstice and equinox. This article will explain the difference between them. Solstice refers to either of the two days of the year that have the most and the least sunlight in any part of the world. It happens two times in a year, and these events are called the summer solstice (i.e. June solstice) and the winter solstice (i.e. December solstice). The summer solstice typically occurs on June 21. 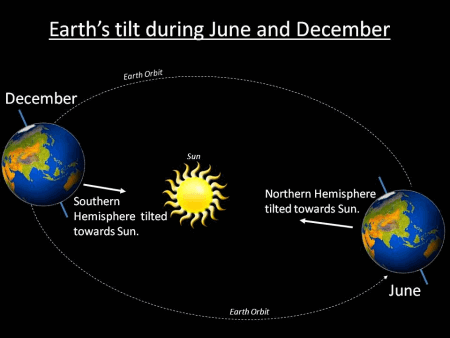 This is when the Northern Hemisphere is angled towards the sun and the Southern Hemisphere is angled away from the sun. The sun is at its highest point in the sky as viewed from the North and South poles. The term “solstice” is the combination of the Latin words sol for sun, and sistere, which means to stand still. This is because, as seen from earth, the sun stands still, or stops in its path before it reverses direction during its seasonal movement. The equinox occurs the sun is positioned exactly above a specific point on the earth’s equatorial line. It is only during the equinoxes when the “edge” between day time and night time lies at a 90-degree angle to the equator. This results in the equal illumination of both southern and northern hemispheres. The equinoxes are the only instances when the area of the planet closest to the sun (subpolar point) is found on the equator line. This subpolar point on the equator travels up north during the March equinox, and shifts south when the September equinox comes. Many seasons of the year are attributed to the equinoxes. In March, the vernal equinox (March 20) traditionally heralds the start of spring in many cultures in the northern hemisphere. The Persian calendar also marks this as the beginning of a new year, or Nouroz. The autumnal equinox, which occurs on September 22, is considered by most to be the start of autumn. For those in the southern hemisphere, however, the autumnal equinox happens in March and the vernal equinox in September. 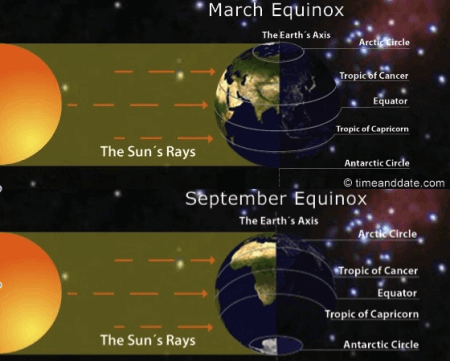 So what’s the difference between a solstice and an equinox? A solstice occurs when the sun is at its farthest point from the earth’s equatorial plane, resulting in longer days and nights. It marks the longest day of the year which falls in summer. It is also during a solstice when the shortest day of the year is experienced, in wintertime. During an equinox, the sun is at its point nearest to the equatorial plane. Because of this, daytime and nighttime are distributed (almost) equally for two separate days; one in March, the other in April. While a solstice happens in the summer and winter, an equinox takes place at the beginning of spring and the beginning of fall.